Described by the band as sounding like a 'slow motion avalanche', Valtari is a return to the gargantuan noise and drifting atmospherics of its classic 2002 album, (). Available in both cd and double 180gm vinyl formats. The vinyl edition comes with a cd insert. 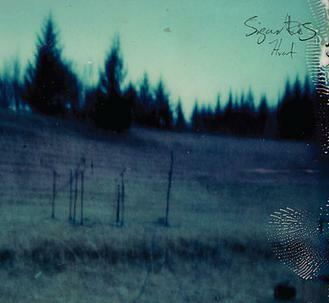 After a four year hiatus, Sigur Rós are returning with a new album entitled “Valtari” on May 28th. ”Valtari” is a double LP and will be released on vinyl, CD and as a digital download. The first track, “Ekki Múkk,” is now streaming on the band’s website, but readers can stream it below. The band describes the album as “an avalanche in slow motion,” a parallel track not taken after 2002′s “( ),” and it’s manifest in the sound of “Ekki Múkk.” It’s intricate, crystalline, beautiful and melancholy, but the thing about aesthetically imagining an untrodden parallel branching moment post-2002 is that it’s a nostalgic maneuver. A nostalgic turn does not necessarily mean that Sigur Rós hasn’t crafted something wondrous, only that one should never retread or replicate. But if “Ekki Múkk” is any indication, this is exactly what the Icelandic four-piece has done. Even so, the single is a beautiful bit of music. He has a wife named Svanhvít. He has a stepdaughter, Salka, who has a song named after her, and a younger daughter Elena. His father, Haukur, is a news reporter on a local TV station, Stöð 2 (Channel 2). His mother's name is Helga. He is the only member of Sigur Rós without a patronymic name: the majority of Icelanders have a patronym rather than surname. The song "Salka", a former live only song, released on Hvarf/Heim in 2007, is named after his stepdaughter. Georg has two brothers; Kjartan Dagur Holm (1989), a guitarist in For a Minor Reflection and Starri Holm (1999). He and Jónsi are the remaining founding members of Sigur Rós. He sometimes plays using a cello bow. As do other members of Sigur Rós, he plays multiple instruments during a typical live show. This often includes, in addition to electric and acoustic bass guitars, keyboards, glockenspiel, and drums. /// Thanks to Consequence of Sound (http://consequenceofsound.net/2012/03/sigur-ros-to-release-new-album-valtari-in-may/) for mentioning what slipped out in a recent interview with list-loving Q Magazine (http://www.qthemusic.com/): Sigur Rós have a new album with a shorter name than their last! The follow-up to 2008’s Með suð í eyrum við spilum endalaust (TMT Review) is called Valtari (which translates to “steamroller”) and will be released in the UK May 28 on a record label. My first guess is XL Recordings, and only the passing of time will tell if I’m as much of a “seer of things yet to be [announced]” as they say, whispered around the halls of Q Magazine. Local xenophobes should again stay clear of this new Sigur Rós effort, as none of the lyrics will be sung in English, spelling disaster for any Americans hoping to hold office in the future when there’s an old 2012 YouTube video of them singing along to “Dauðalogn” in the tub, which roughly translates to “George W. Bush Is Still a War Criminal.” Other details on the album revealed in the interview: Valtari will be focusing on the use of electronics; Valtari will include a girls’ choir; Valtari was chosen as a title for the way, like a steamroller, “the music kind of just rolls over you,” hopefully leaving out the subsequent popping of every ligament individually and shooting arterial sprays of hot blood across the linoleum floor.